STEP 1 Locate your meter box, generally found towards the front of a property, near the street. The box is typically in a direct line with the main outside faucet. It is housed in a plastic or concrete box usually marked "water". Remove lid by using a tool such as a large screwdriver. Insert the tool into one of the holes and pry the lid off. STEP 2 Once you open the meter box lid; lift the protective cap on the meter. On the face of the meter there is a display that should activate when exposed to light, if the meter does not come on then you may need to shine a flashlight into the light sensor (next to the flashlight symbol) located above the display. It will take approximately 5-6 seconds for the meter to display your reading. There will be a total of 9 digits displayed on the screen, this is the reading. We only read the meter to the hundreds so starting from the left you read 5 to 6 digits. Determining the number of digits to read depends on the size of your meter. The display will switch from the reading screen to a rate of flow screen every few seconds to allow you to see exactly how many gallons are going through per minute. 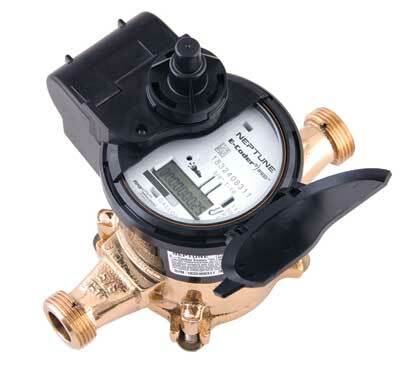 The meter can also help detect a leak on your side of the meter, if it senses water going through during a set number of intervals per day; a dripping faucet icon will appear in the top left corner of the display. This icon may either be solid (continuous leak) or flashing (intermittent leak). This icon along with the rate of flow could help determine what kind of leak, if any, to look for. We can also perform a data log on these meters which will produce a graph displaying the usage per day of the last 90 days. Your first data log is complimentary but each one after that is $50.